2019 CADCA National Forum Transforming Communities: The Power of Prevention. 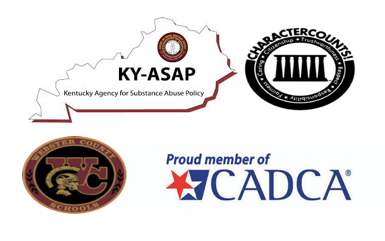 Seth Ranes, Youth True Blue Crew, Raygan Ranes, Youth True Blue Crew, Kevin Ranes, Youth True Blue Co-Sponsor, Melea Ramin, WC KY-ASAP Chairperson, Carolyn Sholar, WCBOE District Liaison, and Donna Bumpus, DFC Coordinator attended the forum. Participants had the opportunity to attend training sessions, hear keynote speakers, speak with legislators, and even see our 1st Lady. Raygan Ranes was one of three youth attending the CADCA Conference asked to participate on a panel in a session on Over the Counter Medicine. The students responded to the benefits and challenges of educating elementary students on OTC medicines. Raygan and her father, Kevin Ranes, received scholarships that covered their CADCA conference expenses. Raygan’s scholarship, sponsored by Johnson & Johnson, required her to prepare for the conference by watching videos on OTC medications. She will also present OTC medication information to elementary students in WC. Kevin Ranes served as a monitor for various conference sessions.